An installation running WHMCS version 7.4 or earlier does not show version 7.5 as available in the Utilities > Update WHMCS page. 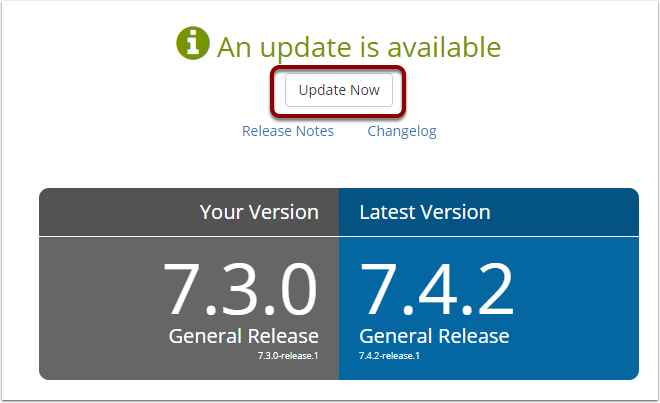 The latest version available is shown as 7.4.2. The system may not yet have checked for updates. The 7.4.2 update needs to be applied first before the 7.5 update can be applied. Due to the increased Ioncube requirements in version 7.5, it is necessary to first update to 7.4.2 which contains extra server environment checks to evaluate the compatibility with 7.5. Then afterwards the 7.5 update can be applied. To read more about the requirements, please refer to the System Requirements and the System Environment Guide. 7.5.0 will now be displayed as the latest version. Click the Update Now button to apply the update.